On the wireless settings screen on the web UI as seen in the image below, there is a pulldown for 'Wireless Mode'. The names are just a grouping together of all the descriptions of the settings. Here is how to break that out into something understandable. PLUS and MINUS are tuners for the top and bottom halves of the channel spectrum, and are supposed to tune performance. 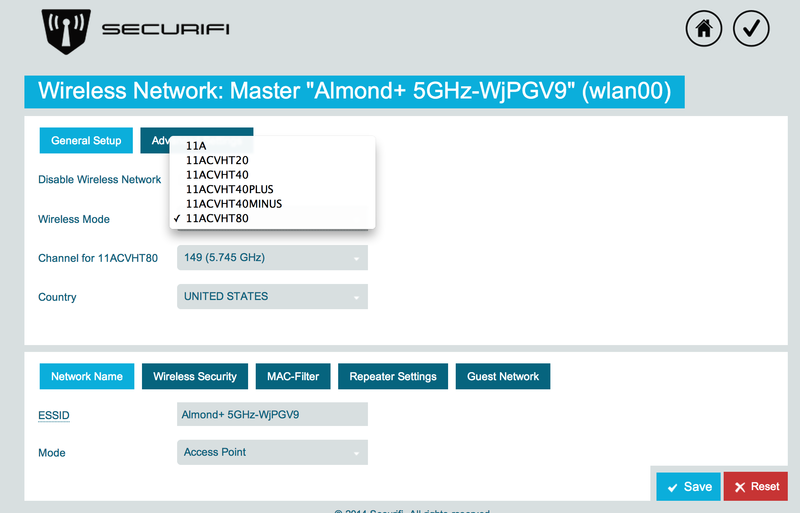 Since the Almond+ has 3x3 MIMO, the AC connection tops out at 1.3 Gbps (using the 80MHz setting as shown in the table above, thus the 11ACVHT80 setting). This will also be limited by the card in your computer as well: for instance, your card only supports 2x2 MIMO so you can only utilize a max of 866 Mbps. This page was last modified on 23 August 2014, at 12:10.